A pedestrian hybrid beacon (PHB) is a traffic control device similar to a European pedestrian signal (PELICAN) that was imported to the US and adapted by engineers in Arizona to increase motorists' awareness of pedestrian crossings at uncontrolled marked crosswalk locations. A PHB is distinct from pre-timed traffic signals and constant flash warning beacons because it is only activated by pedestrians when needed. Figure 1. A PHB in Phoenix Arizona provides protection for pedestrians near a high school. PHBs are becoming increasingly popular with State and local transportation agencies to fill the gap between unprotected crosswalks and full traffic signals to serve pedestrians. PHBs are useful in locations where traditional crosswalk signings and markings do not result in adequate motorist yielding rates, and where the deployment or cost of a full traffic signal would not be warranted. This includes mid-block crossings or uncontrolled mainline crossing points. 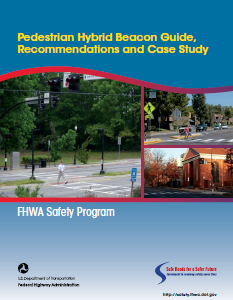 This document will show how PHBs are being used to reduce pedestrian crashes across the country, highlight available provisions for implementing PHBs, and describe how PHB installations improved a problematic section of roadway. Figure 2. A PHB in Washington DC provides protection for pedestrians near a church. The design of the PHB consists of two horizontally-arranged red lenses above a single yellow lens. As shown in Figure 3 below, the signal face for drivers remains unlit or "dark" until the pedestrian activates the system. While the signal is dark, the pedestrian display shows a Don't Walk indication. To activate the PHB pedestrians push an accessible button located on a pole or post at the roadside. The actuated beacon then begins to flash yellow to warn motorists that the beacon has been activated. This brief flashing yellow interval is followed by a steady yellow interval, then by a steady red signal indicating motorists need to come to a complete stop and wait at the stop line. While motorists are seeing the steady red indication, the Walk sign is lit for pedestrians, allowing them to cross the roadway. After the pedestrian WALK phase ends, the pedestrian signal indication changes to a flashing DON'T WALK to notify pedestrians not to begin crossing. During the flashing Don't Walk phase, the PHB displays alternating flashing red lights to drivers. The flashing red indicates to drivers that they are to stop and yield to pedestrians in the crosswalk, and can proceed once pedestrians are clear. 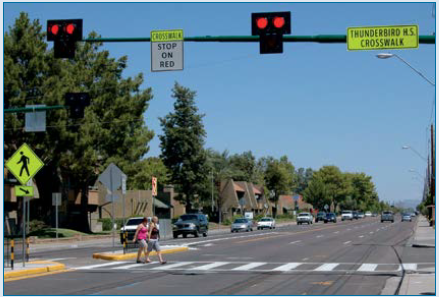 A before and after study of High intensity Activated crosswalk (HAWK) pedestrian treatments performed in Tucson, Arizona, identified a 29 percent reduction in total crashes and a 69 percent reduction in pedestrian crashes. In most states it is illegal to pass a motorist who has stopped to yield to a pedestrian in a crosswalk.5 However, it may be unclear to following motorists if a car is stopped for a pedestrian or for some other reason. The first yielding motorist can obscure pedestrians from the following motorists, which can lead to pedestrians being hit by "second threat" motorists. The PHB addresses this potential problem by clearly indicating that the crosswalk is being used and that all motorists must come to a complete stop. The MUTCD recommends, but does not require, that PHBs be located at least 100 feet from an intersection. When activated, the PHB provides signal indications for the main road, but does not notify vehicles on the side street that a pedestrian is in the crosswalk and that traversing the crosswalk is prohibited (when the indication is steady red) or must be treated as a stop sign (when the light is flashing red). To help promote adequate sight distances for pedestrians and motorists, on-street parking should be restricted within 100 feet of the crossing for approaching traffic and 20 feet from the crossing on the departure side. Where installed on a roadway with coordinated signals, the MUTCD recommends the PHB be coordinated with the other signals. Figure 5. A busy section of a multi-lane, high-volume, high-speed roadway creates pedestrian challenges. If a location is deemed appropriate for a designated pedestrian crossing, then the traffic control should not be selected based solely on the volume of pedestrians; rather it should be selected based upon what is needed to provide a safe crossing. Because of the potential for roadside pedestrian crossing signs to be shielded from cars in the central lane(s), PHBs can be beneficial for all pedestrian crossings of 6-or-more lane undivided highways if traffic signals cannot be justified. 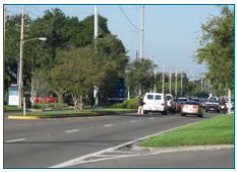 Where used, PHBs should be located outside the functional area of a signalized intersection and outside of any turn lanes or acceleration lanes. In addition to the signal head displays, stop lines and marked crosswalks are required at PHB crossings. Advance stop lines should be used on multi-lane crossings to reduce the potential for second threat crashes (i.e., when one vehicle on a multi-lane roadway stops for a pedestrian but the vehicle traveling in the lane beside it does not). If an existing median is less than 6 feet wide or is not raised, the length of the crosswalk, as indicated in the MUTCD guidance, should allow for the crossing of both roadways of the divided highway. Features near the PHB should be considered when designing and installing the device. Parking should be restricted on the approach and departure side of the crossing to improve visibility. PHBs can be used adjacent to side streets and driveways if the crosswalk and approaching users are clearly visible from the side street. As indicated in the MUTCD, existing signal systems should be considered when installing and operating PHBs. Excessive delays can result in pedestrians not waiting for the signal and as a consequence lead to motorists' non-compliance with the PHB. Immediate response is preferable to having pedestrians wait for the WALK signal. In coordinated signal systems, shorter delays could possibly be achieved by crossing one side of a divided highway at a time. However, this should only be done when the median is more than 6 feet wide. Buford Highway is seven-lane roadway that runs through DeKalb County, Georgia. It has a twoway left turn lane and serves more than 30,000 vehicles per day. While Buford highway has a posted speed limit of 35 miles per hour, traffic frequently flows much faster. Transit serves this corridor with busses arriving every 15 minutes for both directions of travel. Figure 6. PHB protects pedestrians crossing Buford Highway. The land use along Buford Highway is typically commercial with businesses fronting the highway. Curb cuts are common and vehicles are continuously turning to exit and enter the roadway to access business parking. However, just one block away from the highway, the land use is predominantly residential. Consequently, pedestrians are very common in that section of Buford Highway. Adding to the complexity is the terrain. Numerous hills result in restricted sight-distances for motorists and pedestrians. Pedestrians need to cross a wide and busy arterial roadway to access transit stops, businesses, and residences on either side of the roadway. 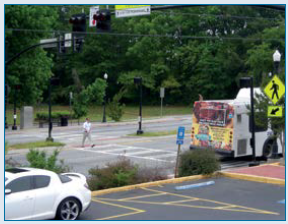 Along this section of roadway in the towns of Doraville and Chamblee, 22 pedestrians were struck and killed between 2000 and 2009; many of these fatalities were near transit stops. Signals are widely spaced so pedestrians have very few opportunities to cross the roadway at controlled locations. 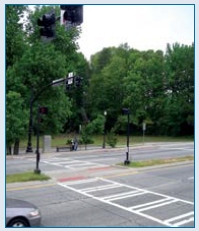 In all, four pedestrian hybrid beacons were installed in the Doraville/Chamblee area of Buford Highway. Each was placed near a transit stop. The PHBs are located away from intersecting roadways, and advance pedestrian crossing signs and advance stop lines were used at each crossing. A modified ladder crosswalk pattern was used for the pedestrian crossing. The PHBs are designed as two-stage crossings. Raised medians were installed on the approaches to the PHB crosswalks. In addition, the crosswalks were offset within the median. The offset crosswalks were intended to encourage pedestrians to look at the oncoming traffic. Additionally, the offset in the median reinforces that the PHB must be activated for the second half of the crossing. Figure 7. PHB installed on Buford Highway near pedestrian attractors: a transit stop. There were several significant design challenges along Buford Highway. Identifying locations serving transit stops with adequate sight lines was the first challenge. Once such locations with adequate sight distances were identified, the design considered the location of driveways. The concern was that right turning motorists exiting driveways would not notice an activated PHB and thus might turn right across the path of a crossing pedestrian. This concern was addressed by adjusting the distance between the advance stop line and the crosswalk to exclude driveways that allowed motorists to exit. To minimize impact on the through motor vehicle traffic on Buford Highway, the PHBs were programmed to work in coordination with the existing signal timing plans. However, the county staff observed pedestrians failing to wait for the WALK indication and crossing without the benefit of the PHB. This, in turn, caused motorists to question the PHBs message that a pedestrian was present when the motorists' indication was red. Consequently, the PHBs were removed from the signal timing coordination sequence, and no significant adverse impacts have been observed. There has not been time to perform a formal before-and-after evaluation of the PHBs along Buford Highway. 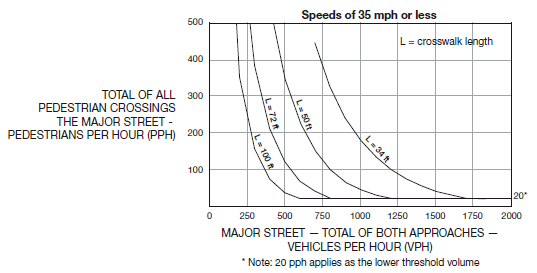 A speed study through the area, however, showed that the installation of the PHBs resulted in reduced vehicular speeds along the roadway. This allowed the County and State to lower the speed limits along Buford Highway. The PHBs have been positively received by the community. Four additional PHBs are under construction along nearby roadways and more are planned for Buford Highway. Most pedestrian fatalities occur at mid-block crossings or on multi-lane roadways at non-signalized locations. For pedestrians, walking just a half block out of the way to get to a signal can increase their delay by up to 3 minutes or more (note: assumes a 660-foot block, and walking speed of 3.5 to 4 feet per second)—a delay which would not be tolerated by motorists at a traffic signal. PHBs support the concept of "complete streets," a transportation policy and design approach that calls for roadways to be consistently designed and operated with all users in mind: bicyclists, public transportation vehicles and riders, private motor vehicles, and pedestrians of all ages and abilities. Because the installation of PHBs increases safe pedestrian opportunities to cross the street the mobility of pedestrians and the livability of our communities are improved. PHBs can be effectively used to address public requests for crossings, resolve safety issues, or generally increase pedestrian access where needed. Agencies should consider locations with significant pedestrian demand that meet MUTCD traffic speed and volume warrants in justifying installation of a PHB. Pedestrian mapping studies can be performed to see if pedestrians can be channelized to a specific location to cross the street. During design and deployment, agencies should consider location-specific issues, signing and marking, length and width, adjacent features, and signal systems to create an effective feature that improves safety while maintaining mobility for all system users. Traffic signals are often considered to remedy pedestrian safety crossing issues. 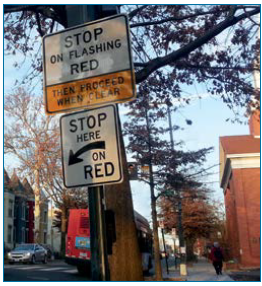 If a traffic control signal is not justified or warrants are not met through an engineering study, agencies often do not provide an intervention. However, it is in these situations that agencies must continue to pursue solutions, such as PHBs, to improve safety for pedestrians and motorists.